The Intermuseum Conservation Association has chosen Mennonite Historical Collection at Bluffton University for a collection conservation assessment. According to the ICA, “The goal of the award is to help the recipient institution identify preservation needs, while information gained through the assessment can help raise funds for addressing those needs” (http://www.ica-artconservation.org/preservation/grants/). BGSU Reference librarian, Carol Singer, is a member of the editorial board for Reverence and User Services Quarterly. Her main responsibilities will be to review manuscripts and advise on the content of the journal. She will serve on the board for three years. The Bryant & Stratton College Cleveland Downtown Campus Library is undertaking a major collection development project this semester to refresh print materials in all academic subject areas. 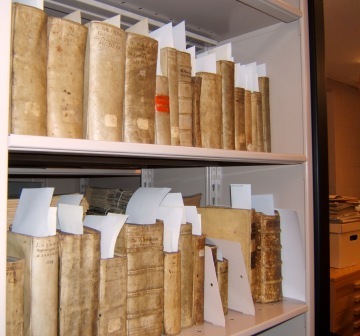 Title lists for this project were created by consensus of librarians across the four-state Bryant & Stratton College system in December 2011 and is in compliance with a requirement of the Middle States Commission on Higher Education. 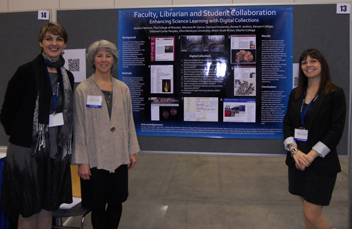 Three science librarians of the Five Colleges of Ohio consortium recently travelled to Vancouver, B.C., to present a poster describing digital projects for science courses at Denison Univ., Kenyon College, Oberlin College, Ohio Wesleyan Univ., and The College of Wooster. The poster and accompanying slides describing each of the science digital projects can be accessed at http://www.slideshare.net/FiveCollegesofOhio/aaas-poster-presentation-slideshow. Alison Ricker, Oberlin, Aimee Jenkins, Kenyon, and Moriana Garcia, Denison, presented the poster at the American Association for the Advancement of Science 2012 Annual Meeting. They co-authored the poster with colleagues Deborah Carter-Peoples, Ohio Wesleyan, and Jessica Clemens, Wooster. Deanna Bachtell has joined the staff as Evening/Weekend Supervisor. Deanna handles circulation, library displays, and various other duties. She has a Bachelor’s degree in both English and Psychology. Betsy Blankenship, Director/Head Librarian is serving as an editorial judge for the Independent Book Publishers Association (IBPA) 24th Annual Benjamin Franklin Awards. Miriam Nelson has joined Ohio University Libraries as Head of Preservation. In addition to the Preservation department, Miriam will also be overseeing the Southeast Ohio Regional Depository. Miriam comes to Athens from Bloomington, Indiana where she worked at the Indiana University E. Lingle Craig Preservation Lab. Miriam received her MLS from IU and an MA in Cultural Memory from the University of London. By overseeing the two departments within the Hwa-Wei Lee Library Annex her work will integrate preservation as a long term goal into Ohio University Libraries’ current practice. Almost 900 people like the Facebook site of the Learning Resources Center at Southern State Community College: http://www.facebook.com/sscclrc. This active site provides news and events, photos and videos from the LRC at Southern State. We want our colleagues at ALAO to also ‘like’ us on Facebook. Click on Events and check on the latest happens on campus and online. The library staff is busy preparing for National Library Week April 8-14th. Activities are planned on all four campus libraries. Maureen Barry recently published an article titled “Librarians as Partners in Service-Learning Courses (Part I). in the Spring issue of LOEX Quarterly. She also recently co-presented “InfoPOWer: Super Librarian to the Rescue During the Transition to College,” with Catherine Queenr, and Lindsay Midkiff-Miller (of Miami University Libraries) at the National First Year Experience Conference in San Antonio Texas.